Camping At Garner State Park! 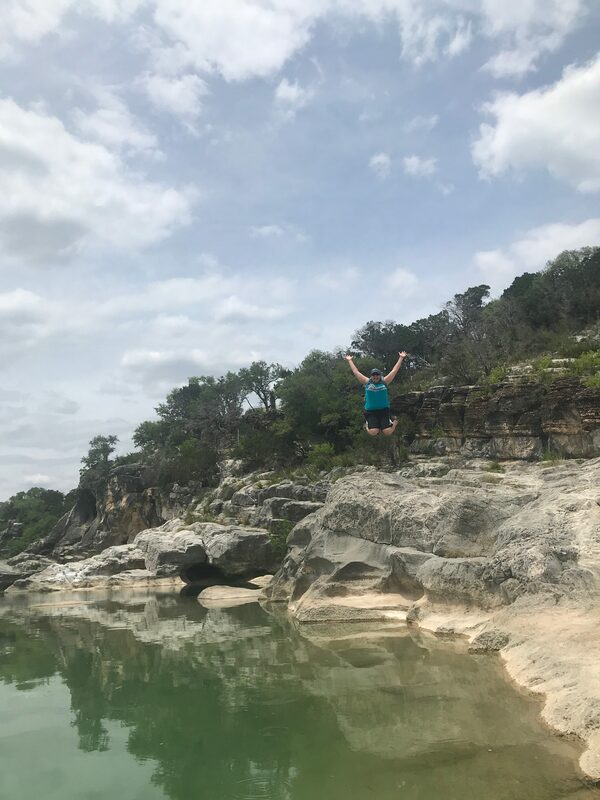 July 27, 2018 / Christy / Comments Off on Camping At Garner State Park! So, I don’t particularly like camping. Why go sleep on the ground when you can sleep in a bed? Bryan has never been camping and he has no desire to EVER go camping. 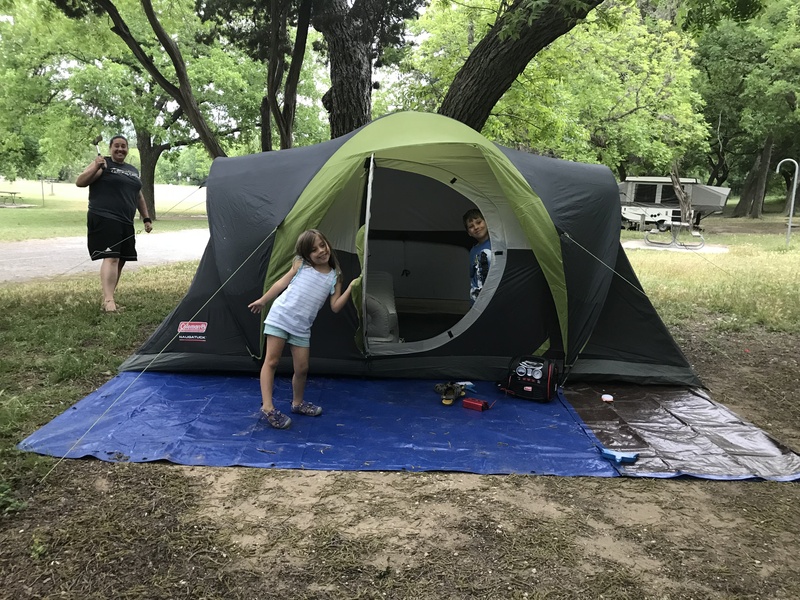 So, Tawni made it her mission to make sure my children get at least 1 camping experience in their lifetime! Our first day was mostly a travel day. We packed up the car then had lunch with Bryan before we drove over to Garner State Park. Once we got there we all pitched in (some more than others) and set up camp! I felt like I was in an alternate universe when Tawni made dinner! No one ever cooks for me so it was a real treat!!! We were there as her guests and she treated us like royalty! The next day we charted out our hiking course and chose a “moderate” hike. I decided to wear my weight vest even thought Tawni thought it looked like a bomb vest! Turns out we started on a moderate hike and ended up on a “hard” hike on our way down. We found a few caves along the way but Tawni and the kids didn’t venture too far into the caves since most of them were inhabited by spiders! After our hike we had lunch and cooled down in the Rio Frio! For it being over 90 the water was VERY Frio! Tawni came to take the kids and I camping and low and behold both kids got an ear infection days before we were supposed to leave. 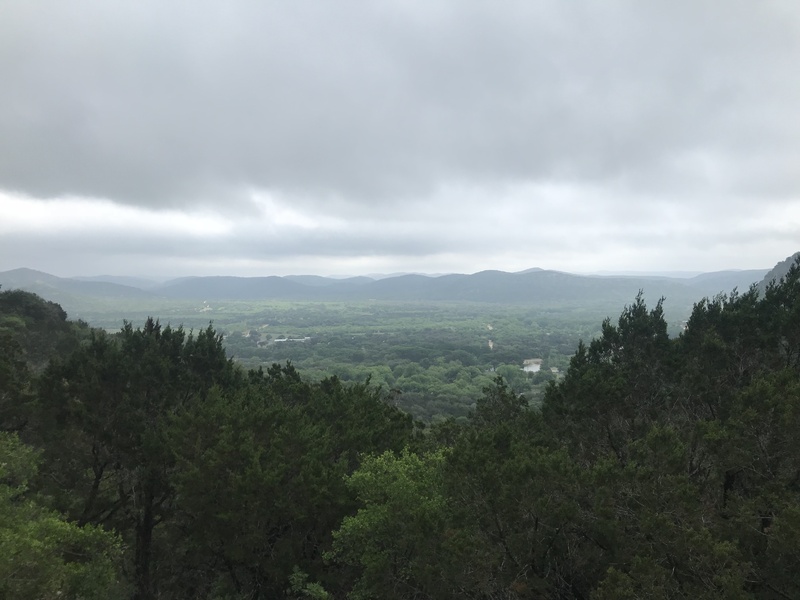 So, we hung low for a few days and and took a 1 day excursion to Pedernales State Park before our big camping adventure. *All children had recovered when we took this day trip! We had so much fun exploring, climbing and throwing rocks into the water! September 10, 2012 / Christy / Comments Off on More Pictures From Eureka! September 8, 2012 / Christy / Comments Off on Fantastic Fern Canyon! Fern Canyon is one of my favorite places to visit in northern California! We had perfect weather the day we took a walk through Fern Canyon. At the end of the trail I was being . . . typical me and Ezekiel took my lead and started picking leaves off the trail and eating them! I'm so glad that he takes after Bryan; there is still hope for him. While we were in Eureka we were able to join in on the Sunday family dinner with Tawni's family! Tawni's sister-in-law brought over a bounce house for the boys to play in and they also had a blast jumping on the trampoline with grandma Sherri! November 6, 2011 / Christy / Comments Off on Coooking With Tawni! In the beginning of November Tawni came for a visit. We always have lots of fun and spend lots of time cooking. For some reason I only have pictures from the night we made an Indian feast for dinner. Tawni came to visit the Anaya family for a long weekend! Unfortunately, it rained the whole weekend so we weren’t able to go on any hikes. However, we still had fun hanging out and playing games. Ezekiel had so much fun with Tawni that he fell asleep way before nap time. Tawni and Shorty Culinary Creations! While Tawni was visiting we had several good meals and sweet treats. We started by making our triple layer brownies. We have made these before together and they were so good the first time that we just had to make them again! The bottom layer is a fudge brownie, followed by a white chocolate caramel layer, then a dark chocolate ganache, topped with pecans. They were so sinfully yummy! Then we also made homemade raviolis. They were filled with bacon, leeks and potatoes. We finished them with a butter sage sauce and some freshly shaved parmesan cheese! We made other yummy treats, but I only took pictures of the brownies and the raviolis. We all probably gained at least 2 pounds by the time Tawni left, but I think we laughed off at least 1 pound. Our friend, Tawni, was in Seattle this weekend so we took the opportunity to hang out, hike, and cook some delicious food. First we visited the actual Granite falls. We took lots of pictures from the platform nest to the river, then we decided to get a closer look and climbed across the rocks right up next to the river. From there we went to the ranger station and got some advice to do the lake 22 hike because there we several waterfalls along the path leading to the lake. Since it was getting late we all agreed that we would hike to the first waterfall we found and then head back. Only going so far was a good thing since we literally found a water “fall”. 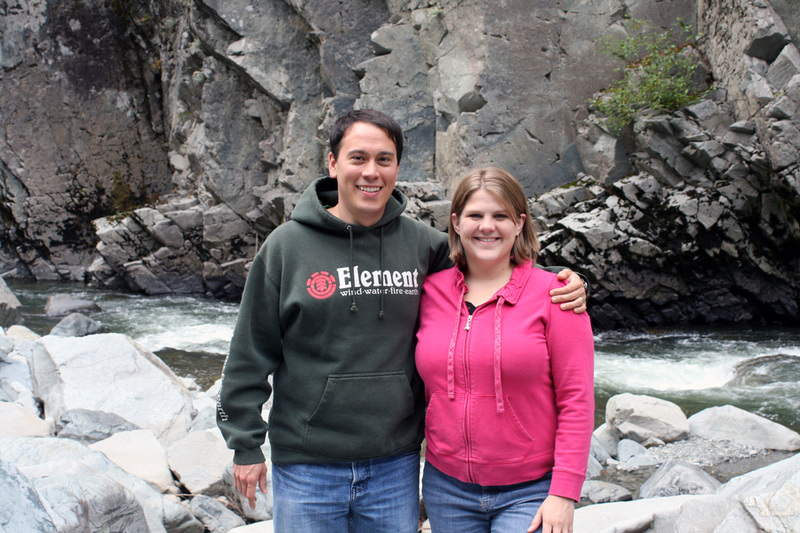 Tawni and I decided to climb under the bridge and across the rocks so that Bryan could get a picture of us in front of the falls. It started out as a good idea until I tried to follow Tawni only to find out I was about three inches too short and would have to find another route. Then once we got onto the rock in front of the falls I slipped and landed in a puddle. Fortunately, for everyone else, Bryan got a picture of the fall and Tawni trying to help me back up. Unfortunately, my pants were soaked for the hike back and the ride home. Later that evening Tawni and I stayed up until midnight making the most delicious brownies. 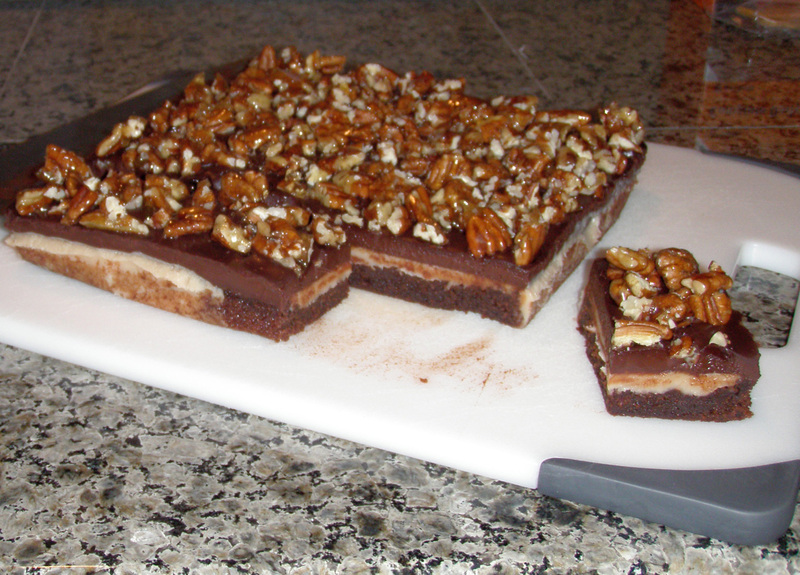 They were layered with brownie on the bottom, white chocolate caramel on top of that, then dark chocolate ganache, and candied pecans to top it off. They ended up being super delicious when we finally ate them on Sunday morning. We always have tons of fun when Tawni comes to visit so we are looking forward to our next adventure. Tawni and Shorty do Humboldt! For the past 5 days I was in Eureka, Ca visiting my good friend from college; Tawni. On Friday night we went to a concert featuring some Irish band. It was fun, except that the 2 opening bands were horrible. Then on Saturday we went to a BBQ with some people that Tawni works with.On Saturday afternoon, we went to the Jetty and had fun climbing around and taking pictures. On Sunday we went to Fern Canyon. It’s this long narrow canyon that ferns have grown all over the sides. It also has a small stream running the length of the canyon. Tawni informed me that they filmed parts of “Jurassic Park” there. So, we spent hours there taking tons of pictures and having lots of fun. After we left the canyon we went to a nearby beach to watch the sun set. It was absolutely amazing. Then, we had some fun jumping off the driftwood into the sand. On Monday, we went to Patrick’s Point and College Cove with Tawni’s friend Rebecca. At Patrick’s Point (on the California Coast) we climbed a huge rock and looked at the beautiful scenery. Then at College Cove we walked through trees, over bushes, and down sand hills to our destination high above the water. Tawni found an awesome blowhole in the rocks where we had tons of fun taking pictures. Then Sunday night we went to dinner at a tipenyaki restaurant with Tawni’s family and had tons of fun. The chef threw broccoli in the air and had everyone try and catch it in their mouth. I was the only one who couldn’t catch it, even after 5 trys. It even hit me in the eye once, so I was glad when he finally ran out of broccoli to throw. Unfortunately, the fun ran out on Tuesday morning when I had to go home. However, we had such a fun time while I was there and we got so many amazing pictures. (We got pretty good at setting the timer and the camera and running!) Check it out below because I posted several of them.